The internet meme isn't entirely accurate, but now you can find out how much Gamestop will really offer with a simple download from our custom price guides. If you own a game store you can use the guide to make sure your trade prices are competitive with Gamestop's. 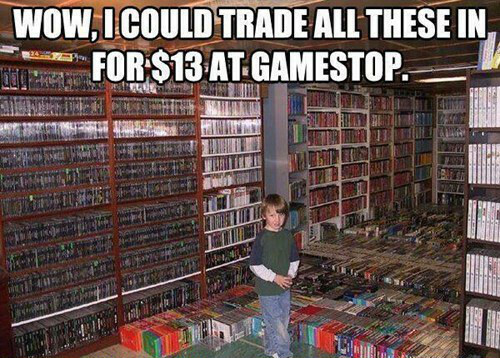 We regularly check Gamestop's Trade-in prices online and update the price guides daily with the most recent price. Right now Gamestop offers trade prices online for all current generation consoles and the previous generation too. Xbox One and Xbox 360. Playstation 4 and Playstation 3. Etc. To add the trade-in prices to a price guide check the "Trade Prices" box for Gamestop then complete payment.